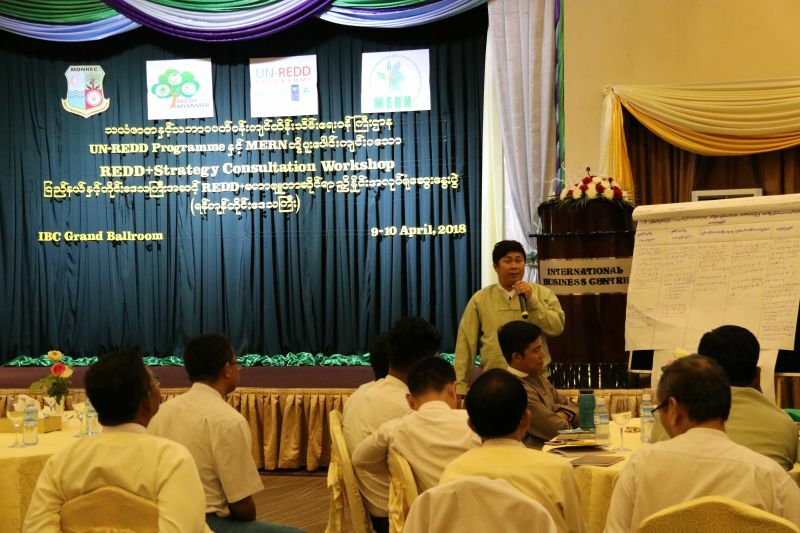 Myanmar REDD+ programme brought together around 60 participants from government departments, CSOs/NGOs from Yangon Region to discuss about the development of REDD+ Strategy drafted at national level in 2017. Yangon region is the 15th state/region to be held the workshop on 9-10 April after completion of series of workshops in 14 states and regions. Yangon Region Minister for Agriculture, Livestock, Forestry and Energy, U Han Tun and Member of Parliament attended the opening of the workshop held at the International Business Center (IBC) in Yangon. The participants from different expertise have brainstormed in groups for proposed drivers. Each group focused on feasibility, practicality and recommendations contributed to the policies and measures related to each of the key drivers of deforestation and forest degradation in the context of Yangon region. The consultation was undertaken 2 days consecutively in order to cover broader discussion on the strategy and to extract key recommendations reflecting the situations happening on the ground. Myanmar needs a strong and clear strategy embedded with practical policies and measures (PaMs) if REDD+ is to be successfully implemented at national level. These all sub-national consultation workshops organized in 15 states/regions will surely serve as a holistic consultation platform to bring all the different ideas from different contexts of Myanmar and those inputs will make the Strategy stronger and clearer than ever.